Hey Bike Partiers! Come out for our first-ever bike party where YOU decided the theme! Last month’s after-party voting overwhelmingly was in favor of, you guessed it, PIRATES! 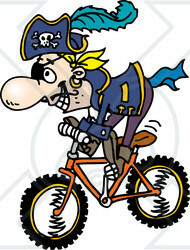 So grab that eye patch, bolt a cleat into that peg leg, and come out and join us! Meet at St Mary’s Park at 6:30, roll out at 7pm! This month’s after-party will be hosted by Little Havana Restaurante y Cantina in their adjacent lot, right on the HAAAAAAAAARRRBOR!